This one has nothing to do with the traveling theme, but at least I made it this week. This is the simple skirt from MADE. It’s my third time with this pattern, after making two unicorn skirts before. This is such a fast sew. Perfect for this, a birthday gift for one of E’s preschool friends. 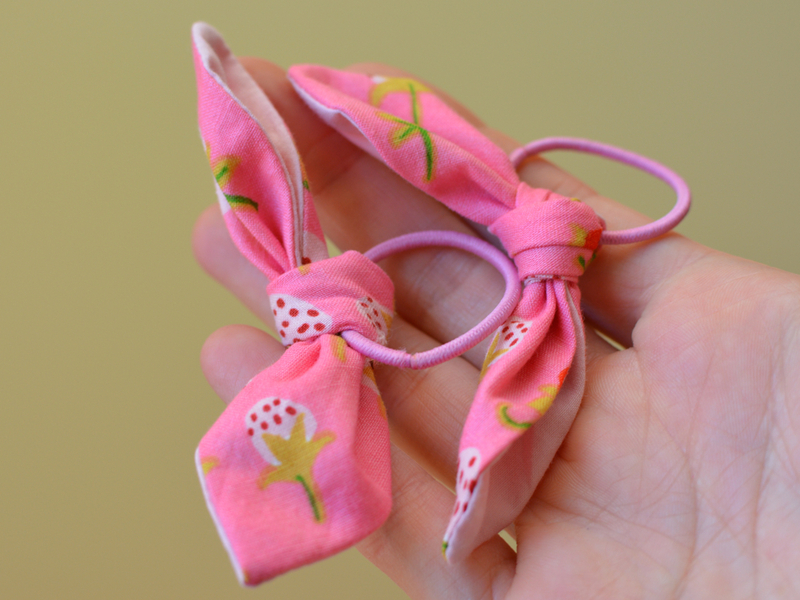 I used the full width of the fabric, 15 inch length, and 1 inch elastic. 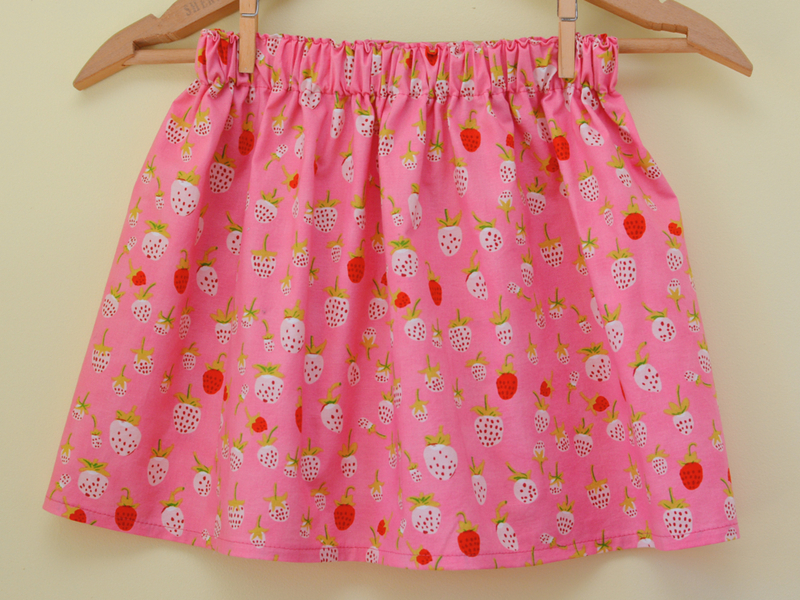 Nothing much to say about this one except that I do love this strawberry fabric from Heather Ross. Lovely and light and the colors make me so happy. 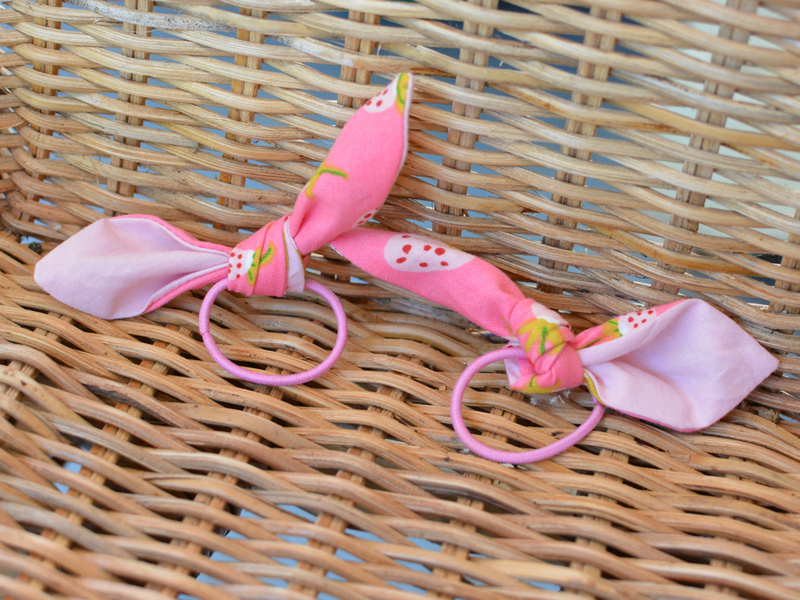 To go along with the skirt I whipped up some hair bows from the free Oliver+S pattern. Super fast and super easy. Kid’s Clothes Week summer edition + strawberries seems pretty perfect. 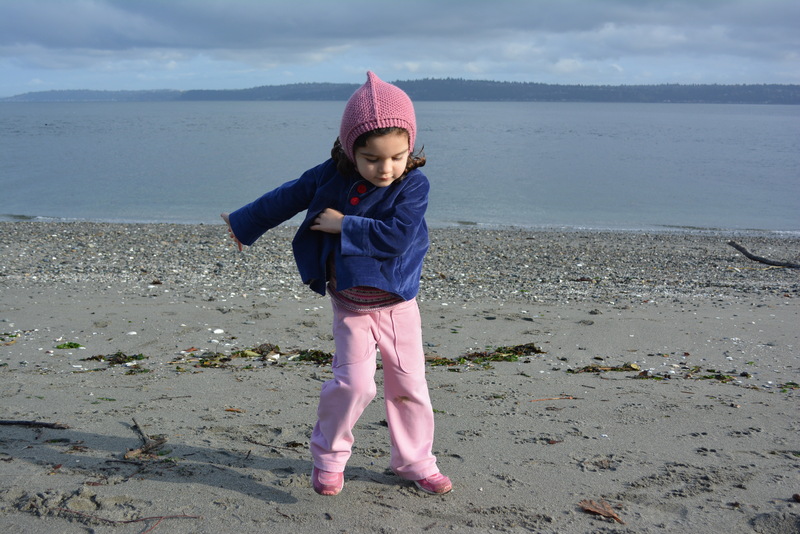 Kid’s Clothes Week is off to a slow start around here so I’m sharing something I made a few months ago but finally got photographed. 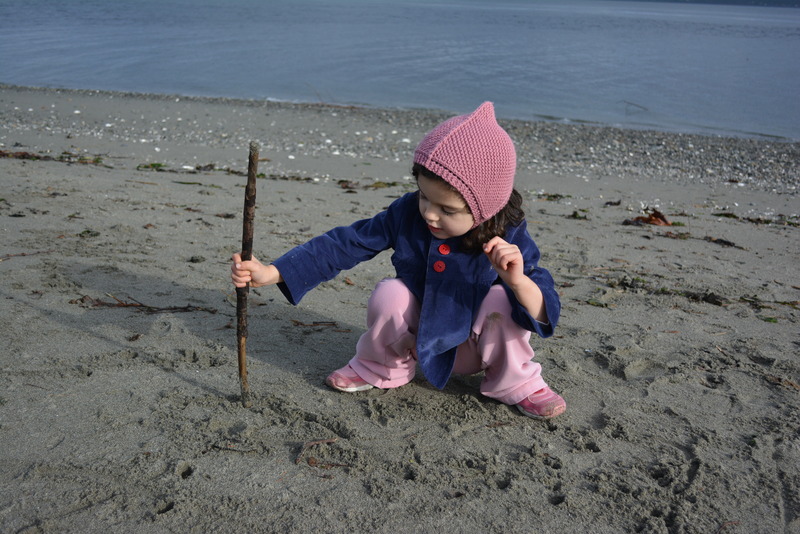 Bonus, it even fits this week’s theme of Wild Things. I actually made this skirt twice. 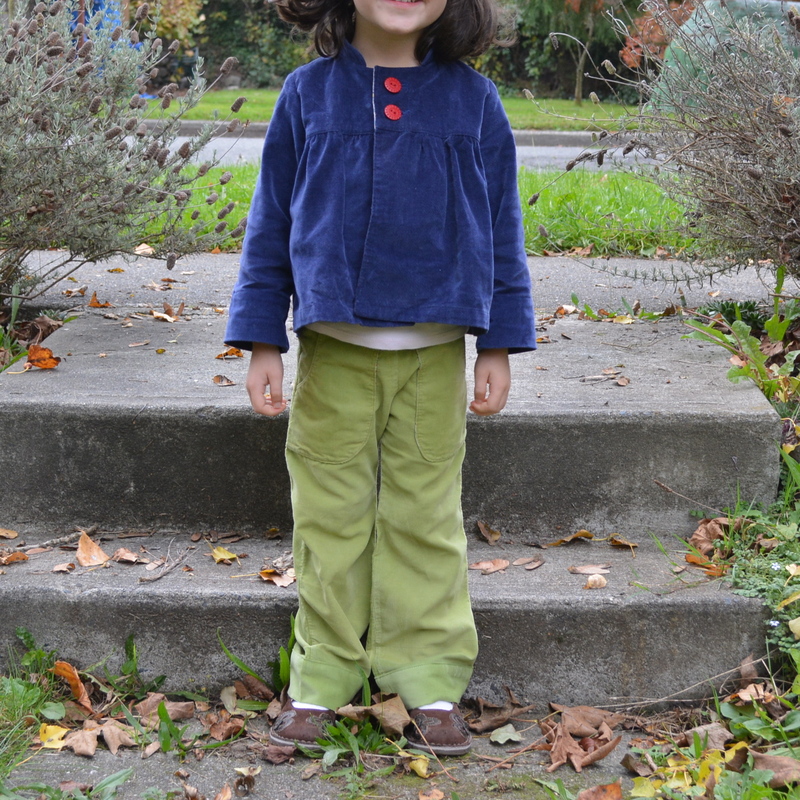 The skirt above was made for E’s little preschool friend and our neighbor. 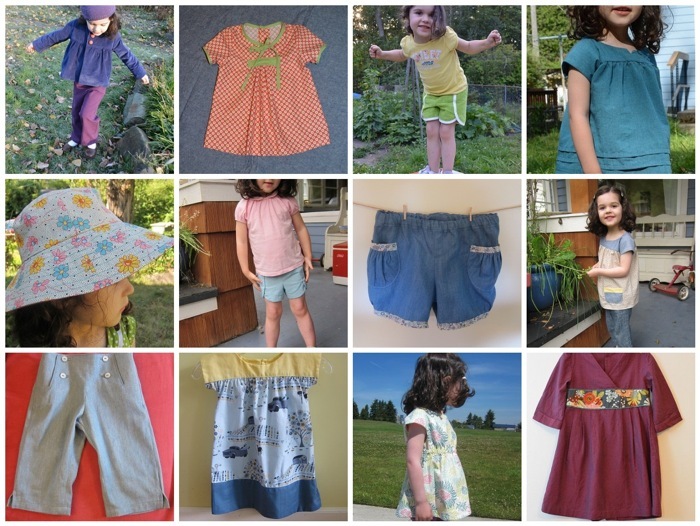 I used the simple skirt tutorial from Dana and added four little pleats to the bottom. 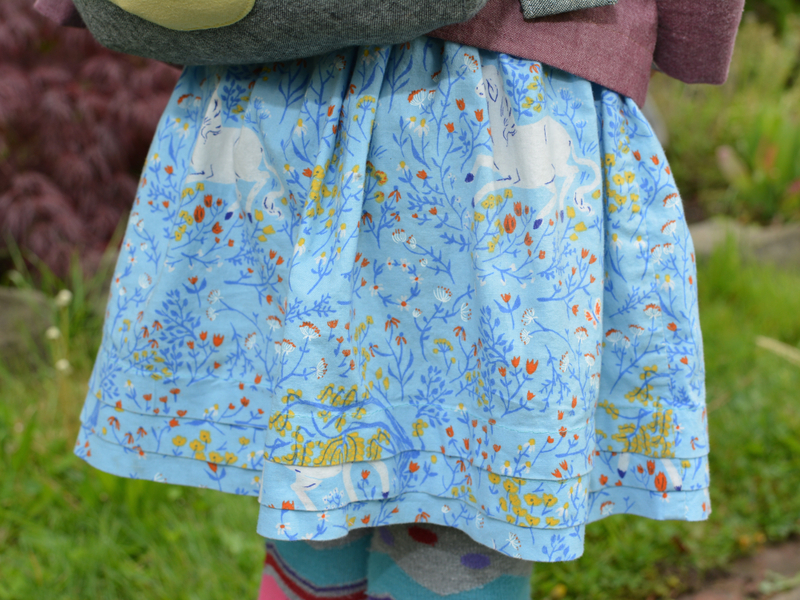 I had a yard of the Heather Ross unicorn print and was able to use the other half to make a similar skirt for E with three deeper pleats. 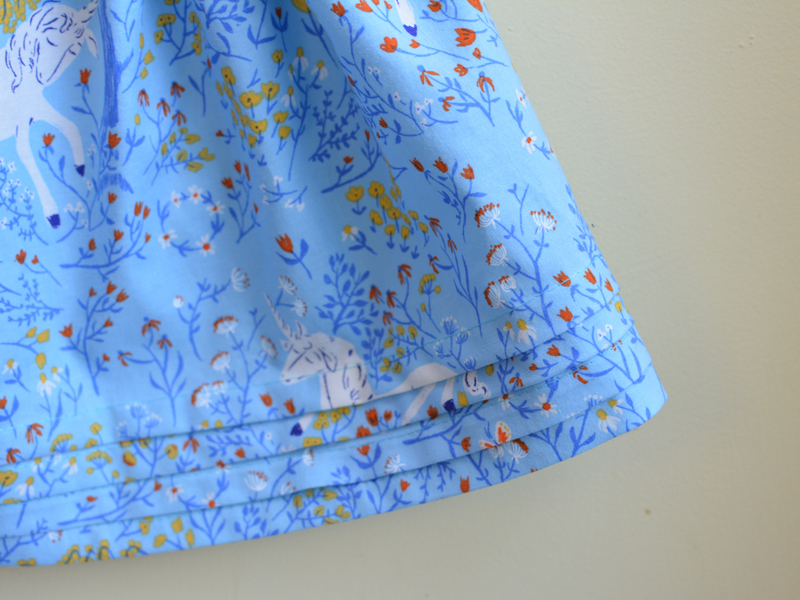 Such a simple skirt but this has gotten so much use and is one of E’s favorites. 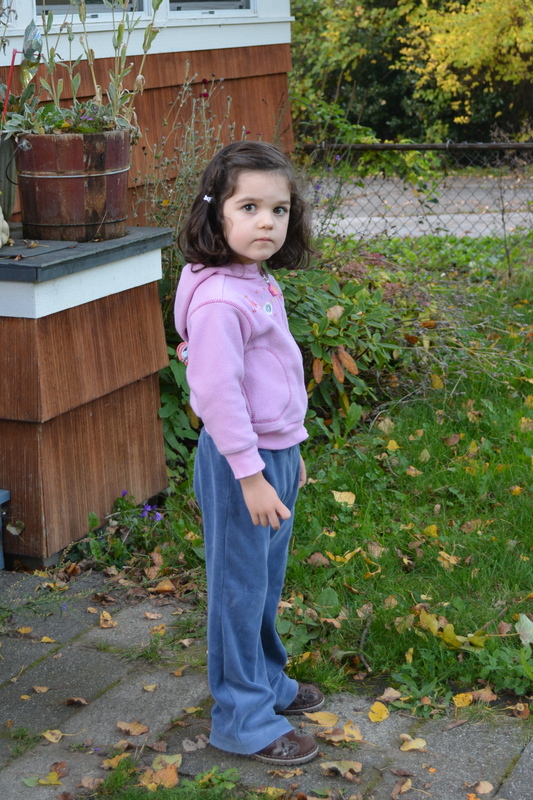 These pictures also show you E’s style these days. She loves bright colors and pattern mixing so I’m trying to follow her lead with my creations. I have to admit that sometimes I feel frustrated with my sewing. It’s slow. 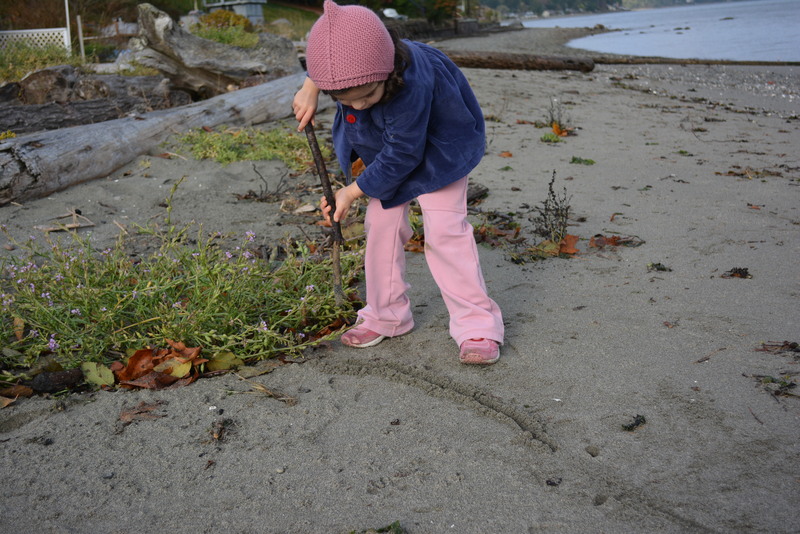 The kids reject the things I make or it’s the wrong size. 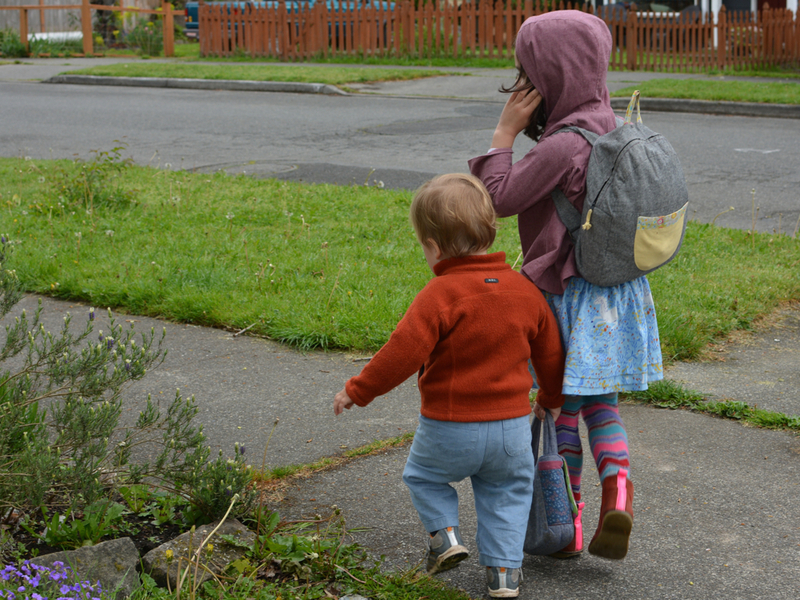 But yesterday, totally by chance, we headed down the street to preschool with so many handmade things getting used and loved. It was good motivation to keep going. Hope to be back soon with more KCW creations. And if you’re sewing along, hope everything is going well! 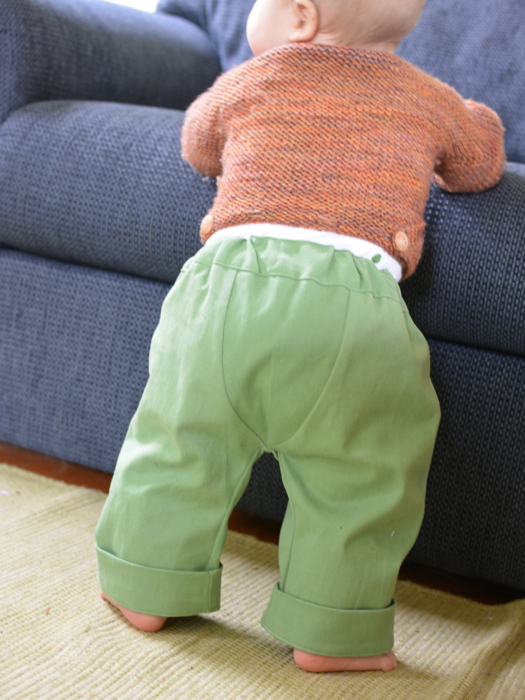 In my quest to find good pants patterns for chubby babies in large cloth diapers, I made O another pair of pants. 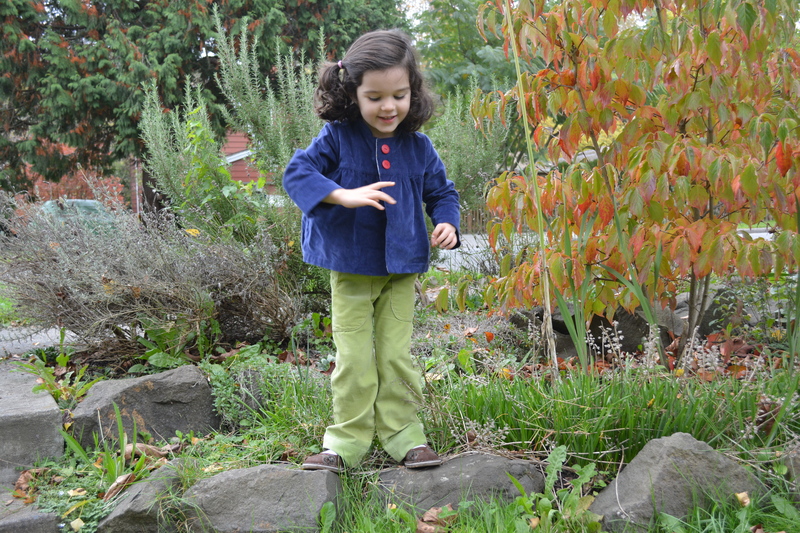 These pants started life as women’s pants, picked up at the thrift store to repurpose. They have a bit of stretch to them and I liked the color. 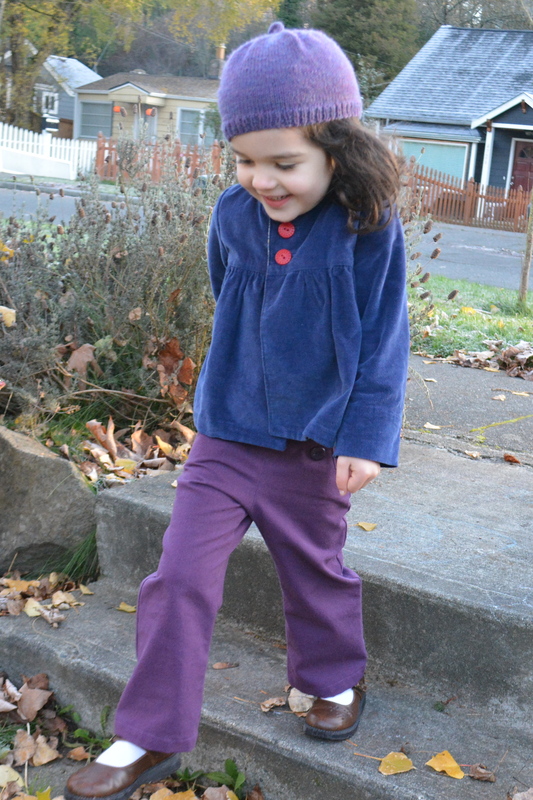 I used them to cut out some pants for E from the Sew Chic Kids book, completely forgetting to add seam allowances. I was able to recut them for O by using a shortened MADE kids pants with the addition of the back panel from the fancy pants leggings. Then I added a waistband and cuffed the ends as they were super long. They are huge and comfortable and I’m imagining many months of wear for these pants. Now that spring has arrived O is out and about in the grass, wood chips, and dirt more. So I thought it was time to make him some shoes. These are the Cameron baby sneakers in essex yarn dyed linen and echino helicopters (I bought it locally but found a listing here). I made a size 3 based on O’s foot measurements and the hope that too small might be better than too big for someone who always kicks off his socks. These stay on better than I’d expected and I love the snaps. 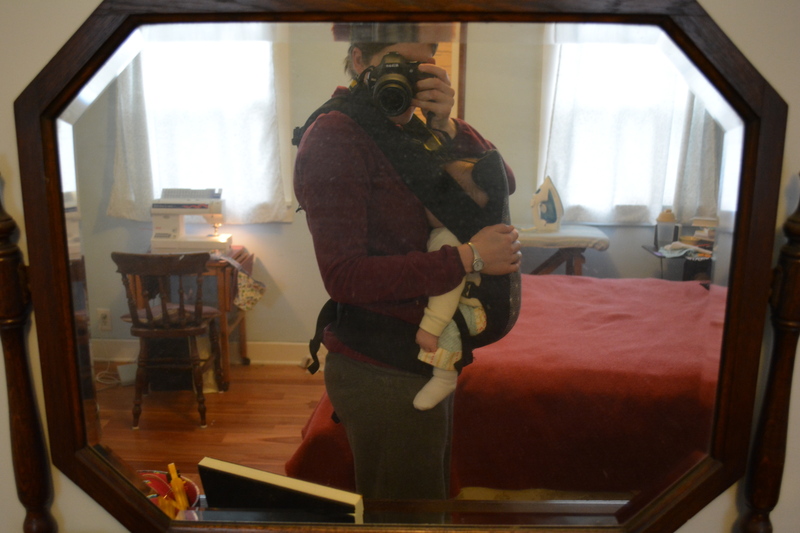 Next time I might use a bigger size but add some elastic to the back. I’ll also do a better job transferring all the markings. I had some headaches and off-kilter straps that I probably could have avoided. 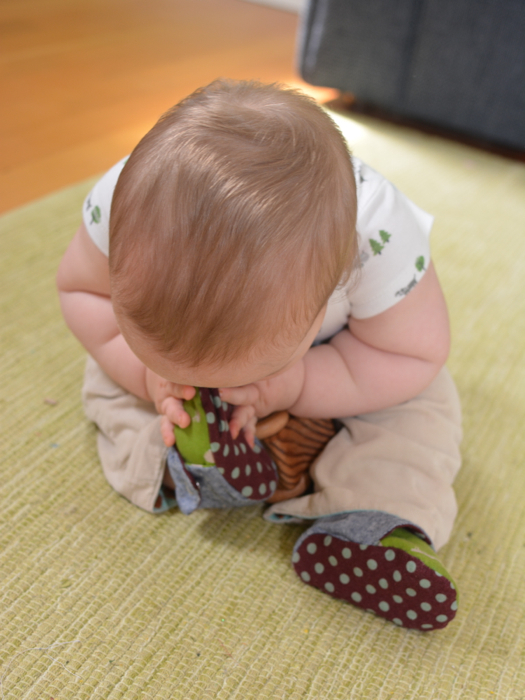 O enjoys chewing on them whenever possible. I didn’t have plans to do any kind of 2013 wrap up, partly because I had no idea how to create the lovely, linked mosaics I’ve been seeing on so many blogs. Then Liesl suggested using Mosaic Maker in her last blog post and I had to give it a try. It was really easy- and fun to see everything put together in this one place. Hope your 2014 is off to a lovely start! Before O was born I was lucky enough to win a copy of the Debbie’s Birthday Dress pattern from Suz at Sewpony. 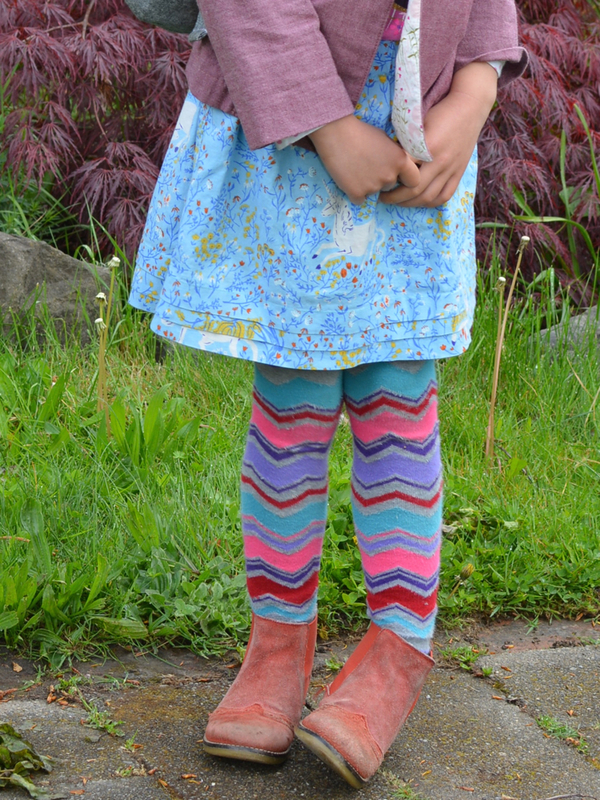 I taped it together right away and then cut out a tunic-length version for October Kids Clothes week. This is view 2, modified to be cut on the fold instead of having a seam. I cut out a size 3, but I miscalculated and it ended up way, way to short for E. I wasn’t sure how best to fix my mistake so I put the pattern aside. 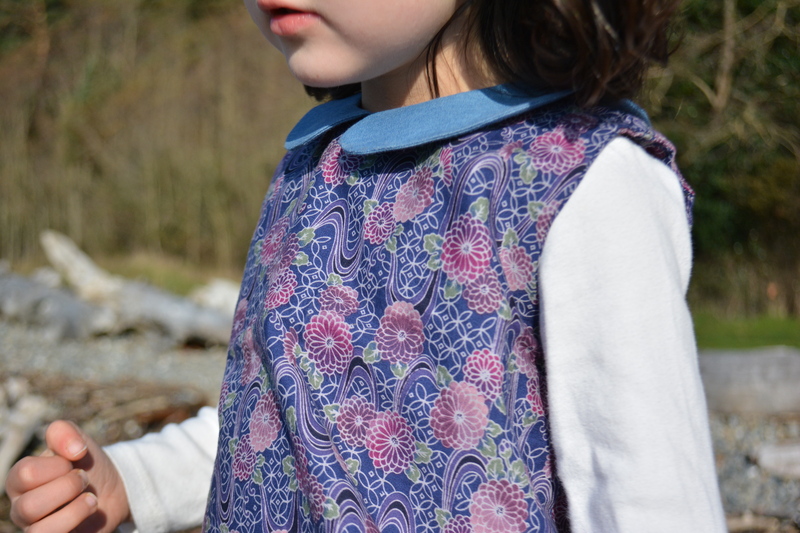 A few weeks ago I decided to have another go and figured out how to cut out a bottom contrast band in blue fabric to match the peter pan collar. I think this will be a nice extra-layer for E as we move into colder weather and this pattern has a unique, vintage feel about it. But for whatever reason the sewing fairies weren’t with me on this project- my seams didn’t match, I cut out the buttonhole loop too long and had to rip it out, I mistakenly trimmed the collar seam so I had a heck of a time getting the collar to lie flat, and adding that band at the bottom while matching all seams and preserving the fun A-line shape was a challenge. But the peter pan collar itself, which I was most worried about, came together without a hitch. The directions were great and easy to follow, as I’ve never made this type (or maybe any type?) of collar before. It also learned how to make a partial lining- I’ve only done linings that are either full-length or end at a waist seam. I faked a partial lining for E’s knight costume but it was nice to have instructions this time around. A few notes- this pattern would work best with a serger for finishing the edges. 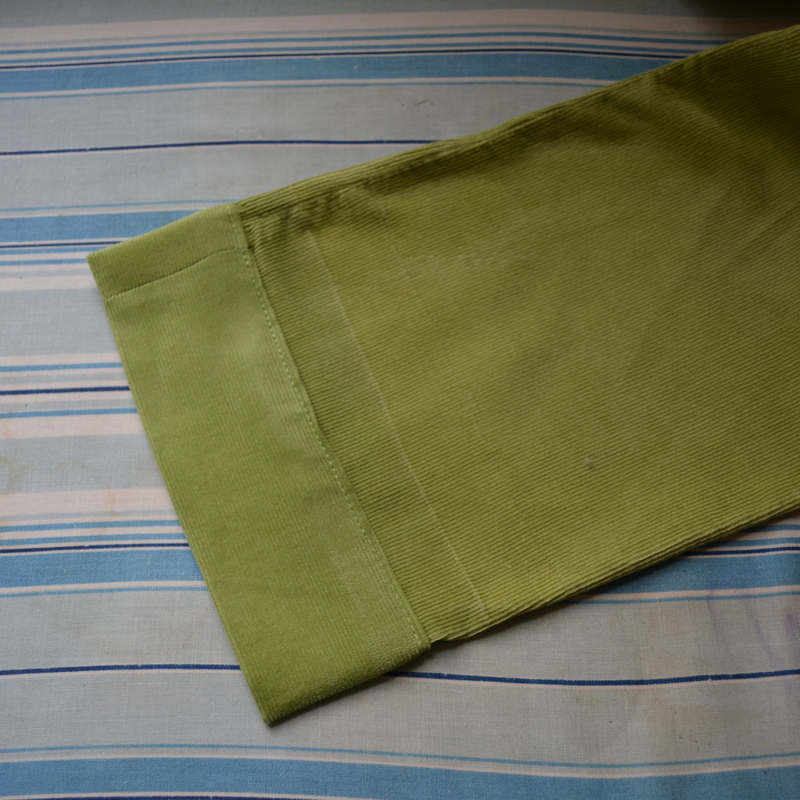 It feels a bit unfinished inside as I had to zigzag some seams and double-fold the lining and hem. Also, this is not sewn from the updated version of the pattern. I’d already printed and taped the pattern and so haven’t yet checked about getting the updated version. 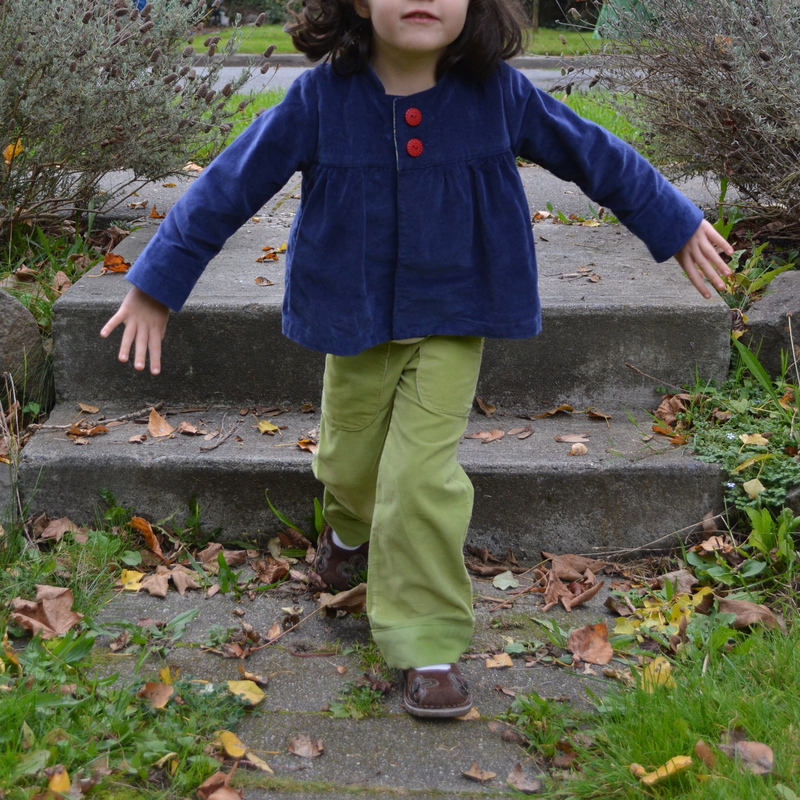 E wore her new tunic with an old pair of corduroy pants. I lengthened these in a similar way to her green pair but this time I cut closer to the hem so the old hem line was hidden in the new seam. You can still see the old stitching line. Should I cover that line with ribbon or rick-rack or something? I’m still not sure. And Thanksgiving outfits? Well, I fell a little behind but should have something to share soon. We did have a wonderful, long holiday weekend with family. I hope your weekend was just as relaxing and lovely! 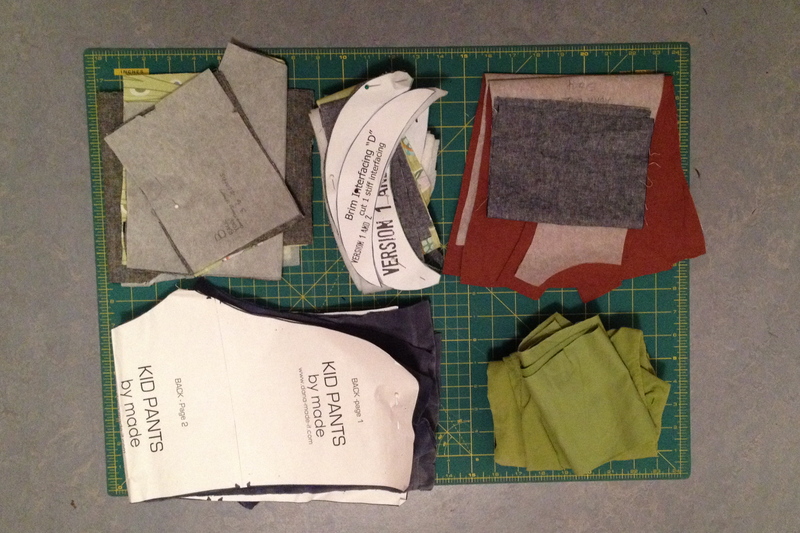 Lately I’ve been good at a few things: buying fabric and new patterns, knitting, and cutting out new projects. But not so good at actually sewing until this week. 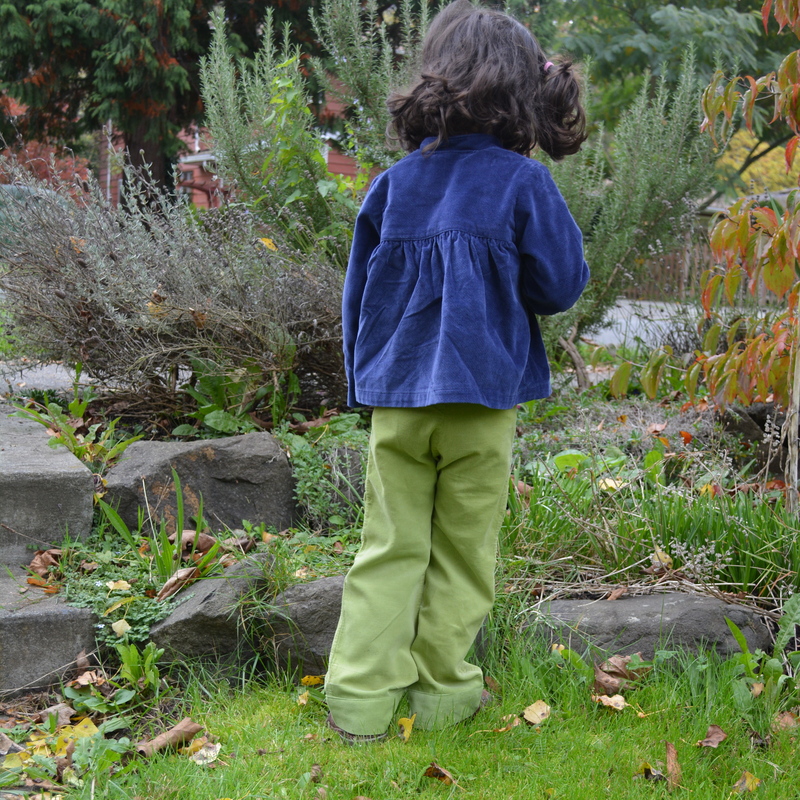 First up, more pants for E. I am trying to find some good patterns since she mostly wears pants and most store-bought ones are either too short or too wide. 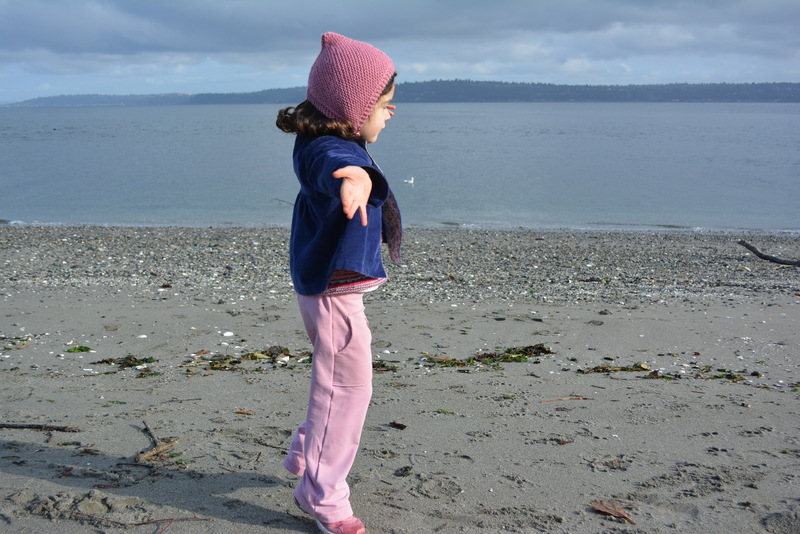 The pair of sailboat pants I made for E last spring were heavily worn into the fall. She loved them, they held up well, and the fit was good. 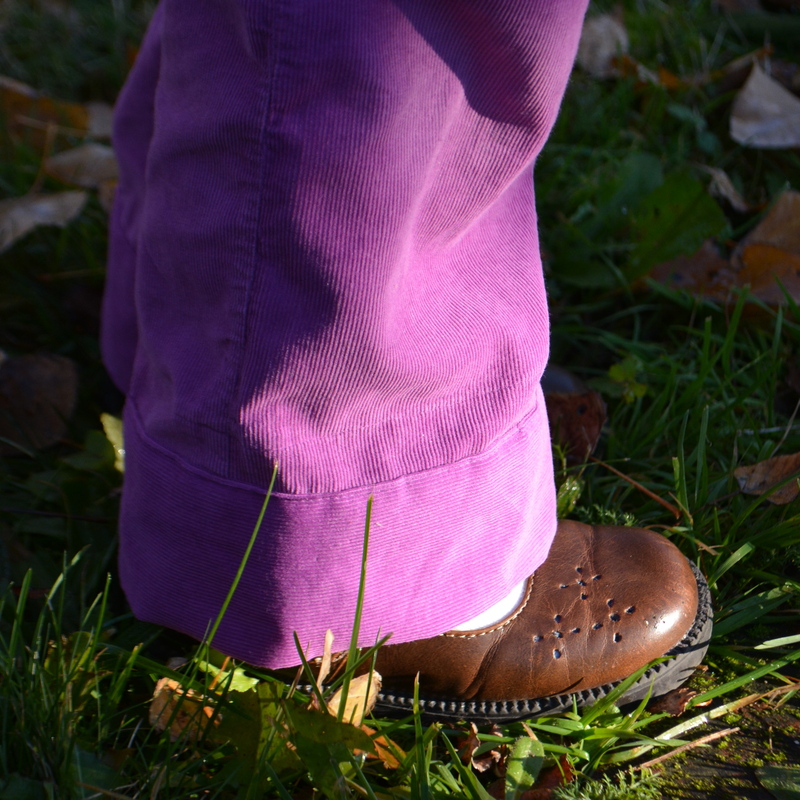 I thought about making another pair this fall but decided to lengthen the pattern to make proper pant-lengths. 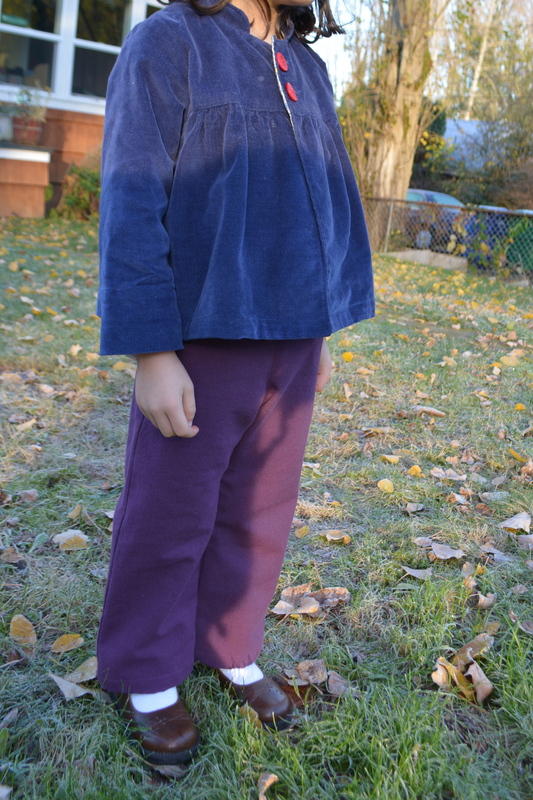 I used all the pieces of the sailboat pattern but then merged the legs with my old standby, the MADE basic kid pants. The sewing on these came together quite well but I was disappointed in the fit, likely created by merging the patterns. They are a bit too wide and too short for E. Functional pants for sure, but not the fit I had in mind. Maybe I’ll try these again with more modification or maybe I’ll just try another pattern. 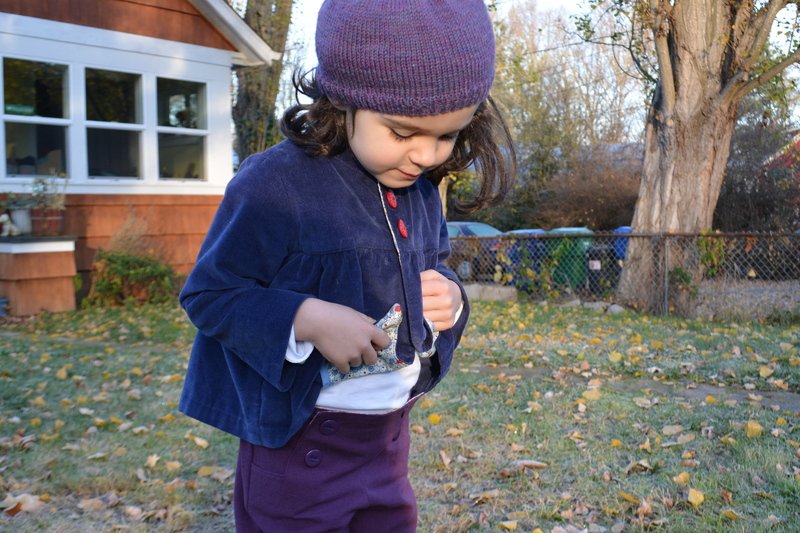 Either way, it sure was nice to be back sewing an Oliver + S pattern. It’s been a while (July- how did that happen?) since I made one of their patterns and I’ve missed the clarity of directions and the nice finishes. I’m excited to use this pattern for O soon. 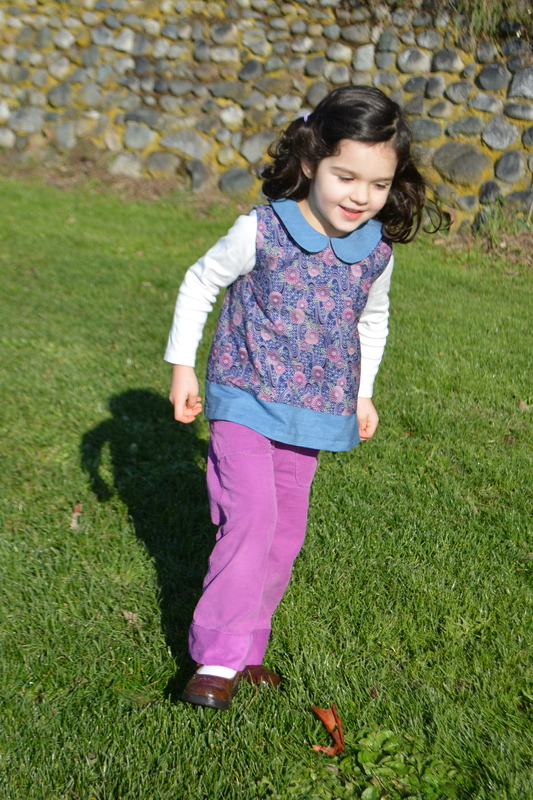 And previously I’d discounted the shirt part of this pattern because I thought it would be too boxy on my skinny gal. But then I saw this dress and then this tunic and changed my mind. 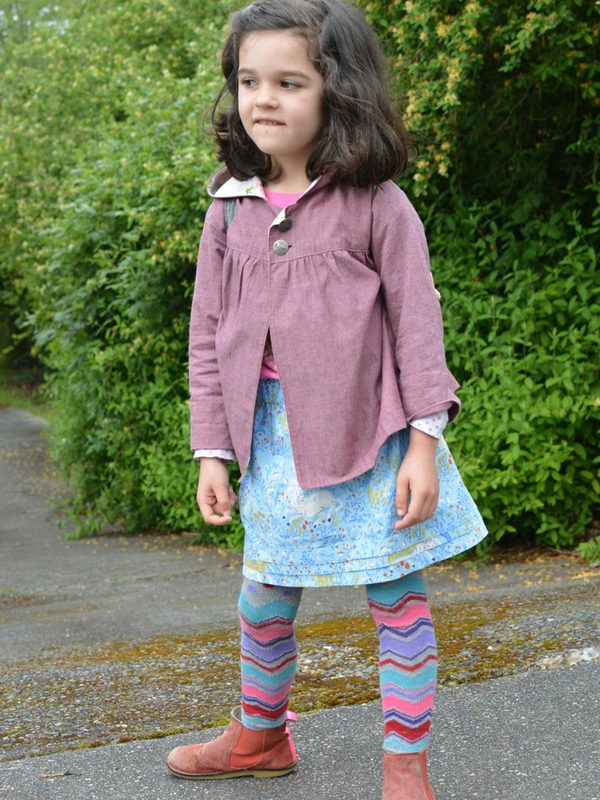 Lengthened into a dress or as a tunic with leggings these pattern would be perfect for winter. Another one for my to-do list. 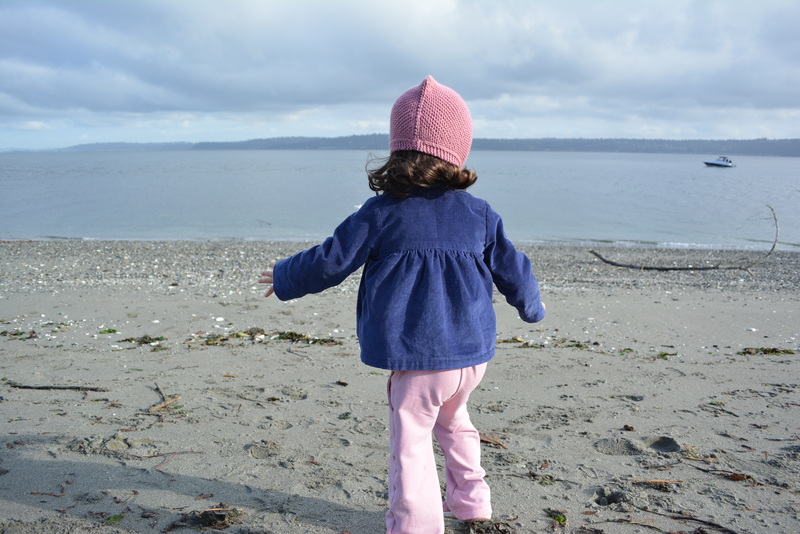 And yes, I took my daughter out for some photos on a rather frosty and crisp morning. We were a bit chilled by the end. Next up, some Thanksgiving outfits for the kids. Not much time left, but I have big plans! 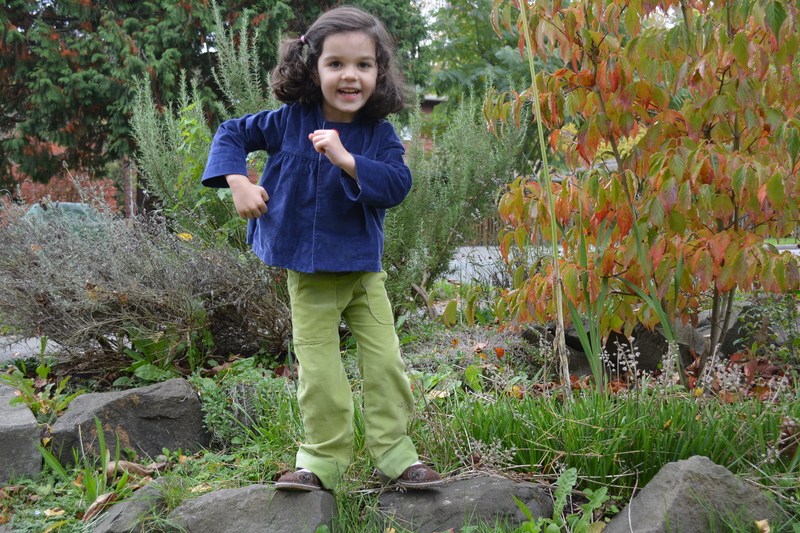 Last weekend I finished up some pants for E. These are yet another pair of MADE basic kid pants. I again used some of my old pants for the fabric. 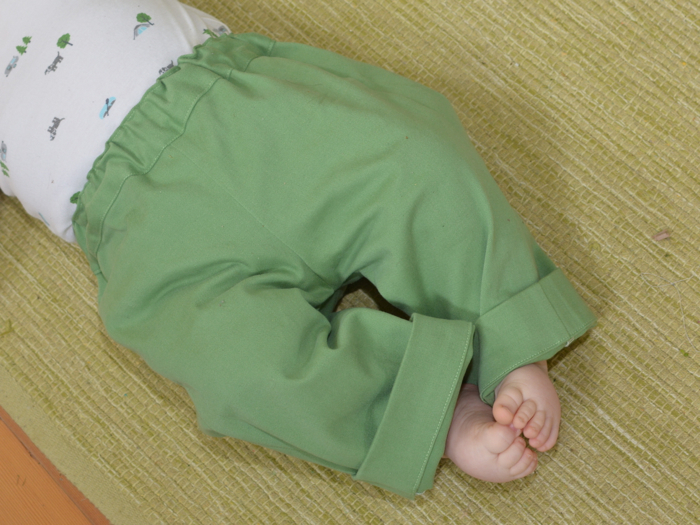 For many years these were my go-to pants each evening after coming home from teaching elementary school. Sadly the waistband had frayed beyond repair. I had to strategically work around some worn spots and stains but I like that these pants can have another life. I felt slightly more confident sewing with knits but my results are still a bit wonky. For these pants I used my mother’s serger for the main seams and have to say, there will be lots more serging in my future. 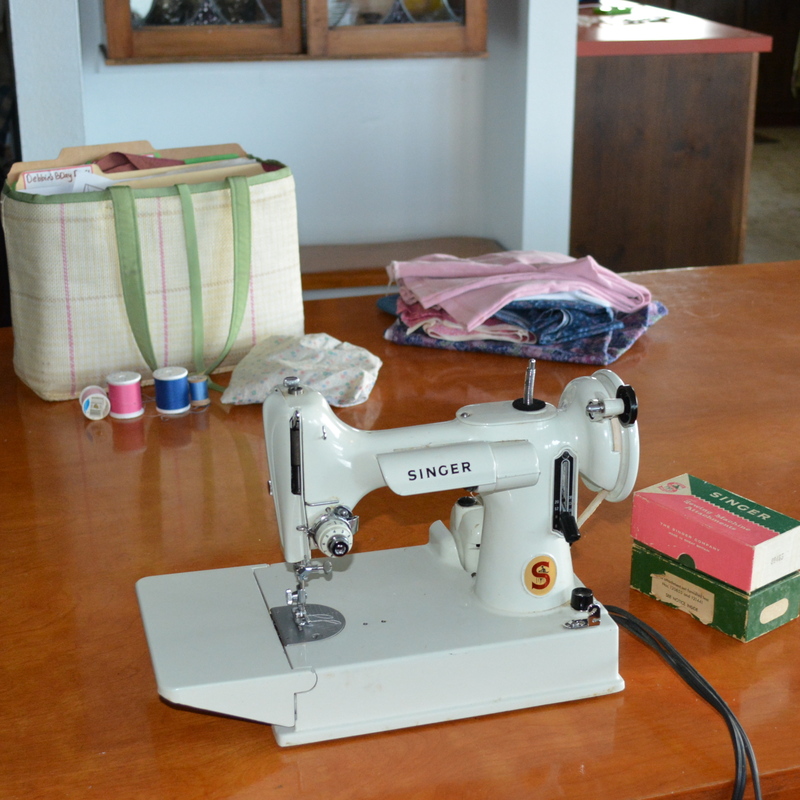 I only know how to do the basic, overlocked stitch so I also used an old Singer Featherweight machine to attach the pockets and sew up the waistband. I love how tiny and simple these machines are- so little to go wrong. The machine has a box of intimidating-looking attachments (you need an attachment to do anything except a basic, straight stitch) but I really only use it for straight seams anyway. These are particularly lovely machines for piecing quilts. My other weekend project was baby mittens for O. I used the baby mitts pattern from Susan B. Anderson. The first pair was too small for O (not checking my gauge gets me into lots of trouble, plus I think O’s hands are really big) so I enlarged the pattern and made a second pair. 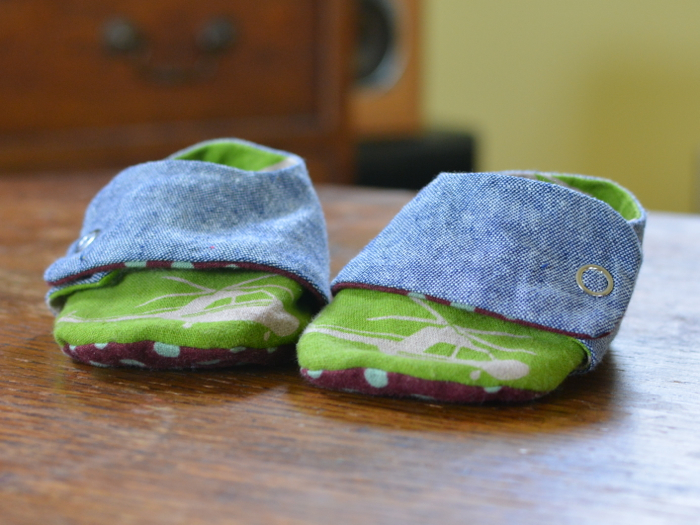 The smaller pair will get passed along to a friend whose baby is a few weeks and many sizes smaller than O. 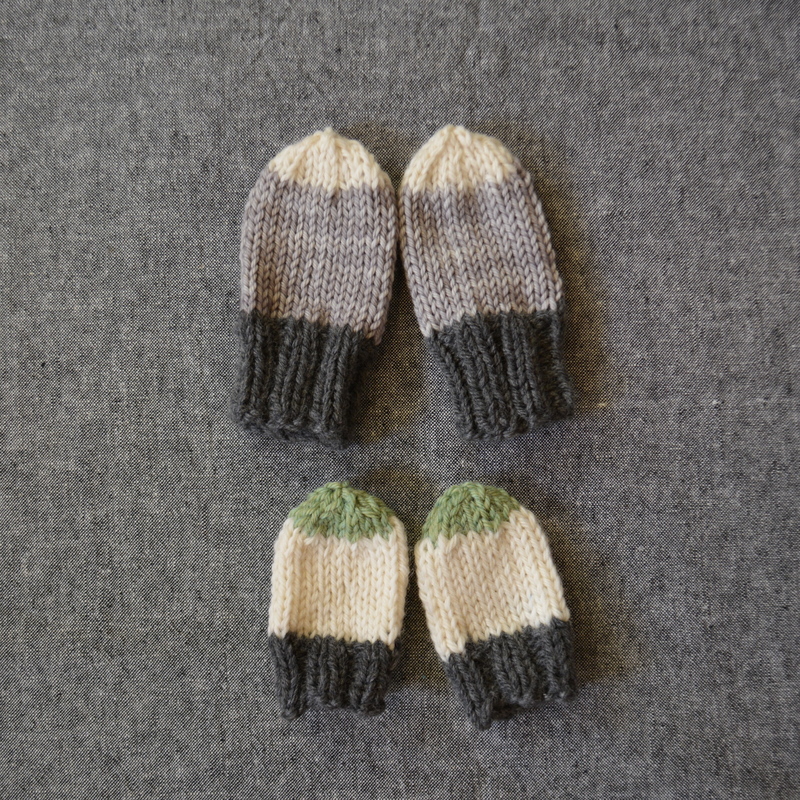 Baby mittens are the fastest thing yet to knit. I may need to whip up a few more pairs! Day 2 of Kids Clothes Week and I did some sewing today and some admiring of all the projects popping up on the KCW website. This season seems to especially have some great wardrobe staple basics. 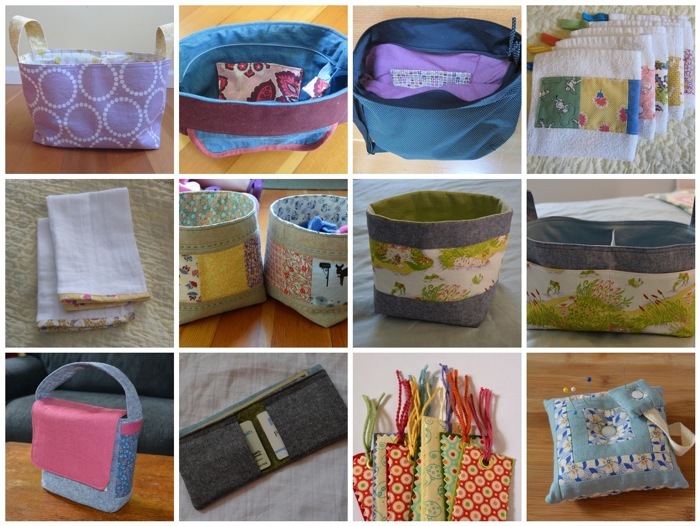 One of my goals this year was to expand beyond quilting cotton to try to make more of these everyday sorts of items. That means tackling my fear of knits. 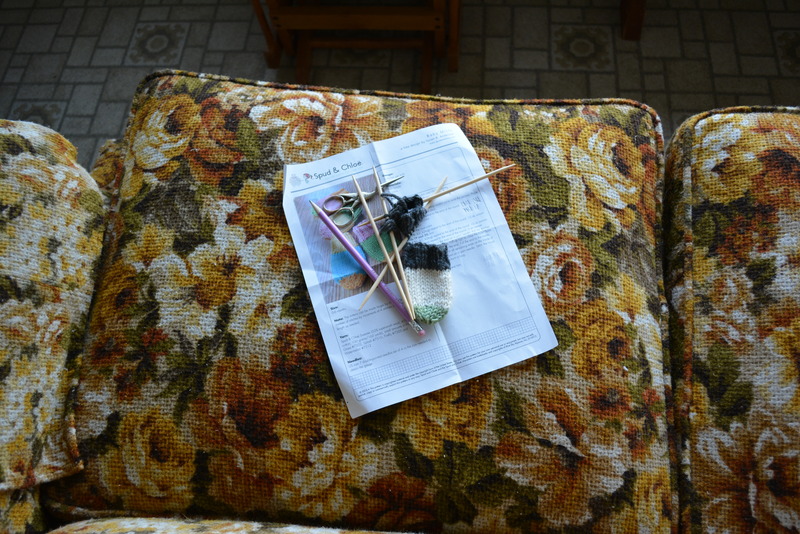 Most blog posts I read about knits go something like this- “I was worried about sewing with knits but then I tried it and it was great!”. Sadly, my few experiences have been super frustrating and turned out some questionable results. But I had a realization that there are all kinds of knit fabrics out there, and maybe some are less likely to be eaten by my machine than the thin t-shirt knits I first tried. 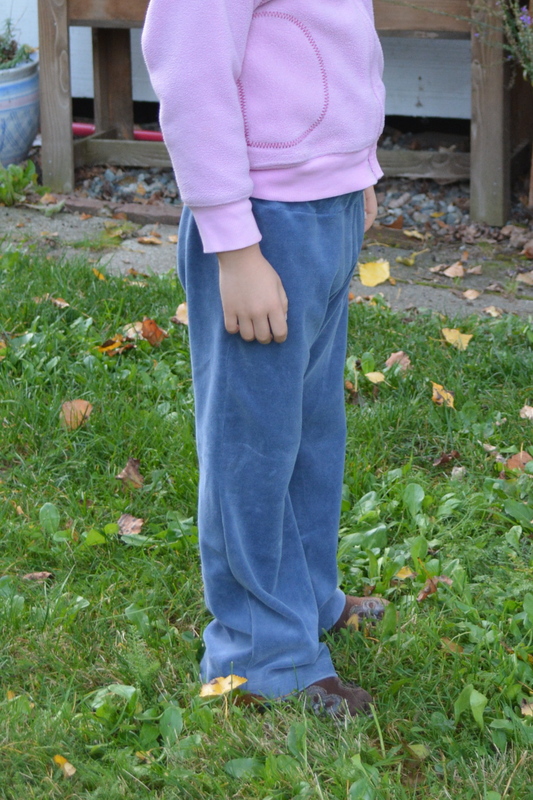 So, I took some maternity pants I no longer need and cut out a new pair of Dana’s basic kid pants. This is the same pattern as yesterday and I’ll be sad when E sizes out of it. Modification: I added about two inches and preserved the original pants hem (which further increases the length) and decreased the seam allowance. 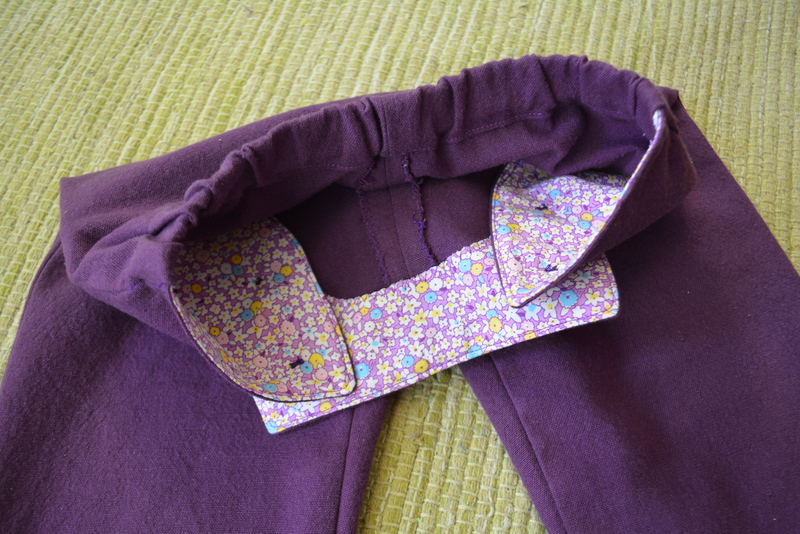 I also ran elastic around the entire waist (even though I cut the flat-front option). I’m getting a little better at figuring out knits. The outside, at least, doesn’t have as many strange puckers and the stitching feels more secure. The inside is still a work in progress. 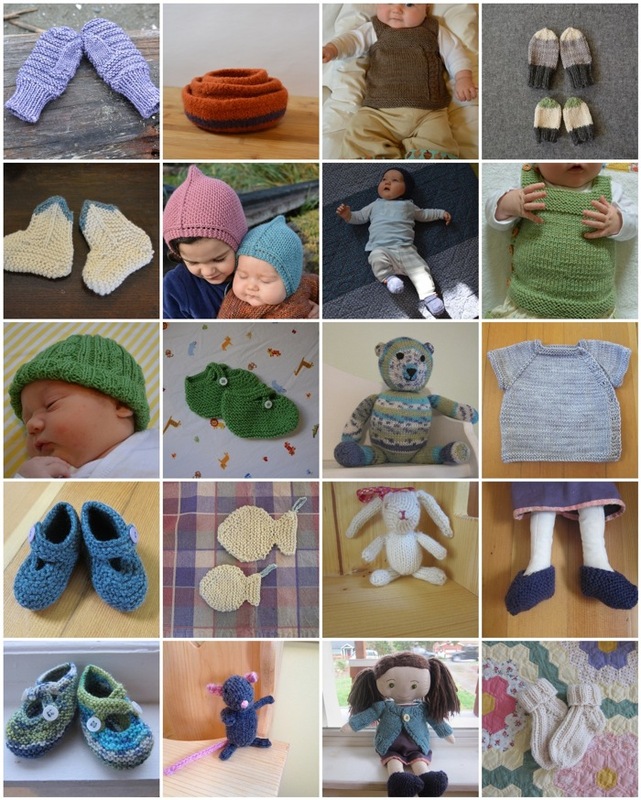 I recently bought a couple of Oliver + S patterns with knits so I’ll see what hints I can pick up there. After that, I think I may need to take an actual class. Sewing with knits is maybe like learning to knit- I needed actual people to see me through the first bit. But that’s the frustrating part. The good part is that these made a super-comfy pair of pants. They are actually too big right now with all my modifications, but better that than too small. I’d still like to make some more pants for E but am not sure what to try next. 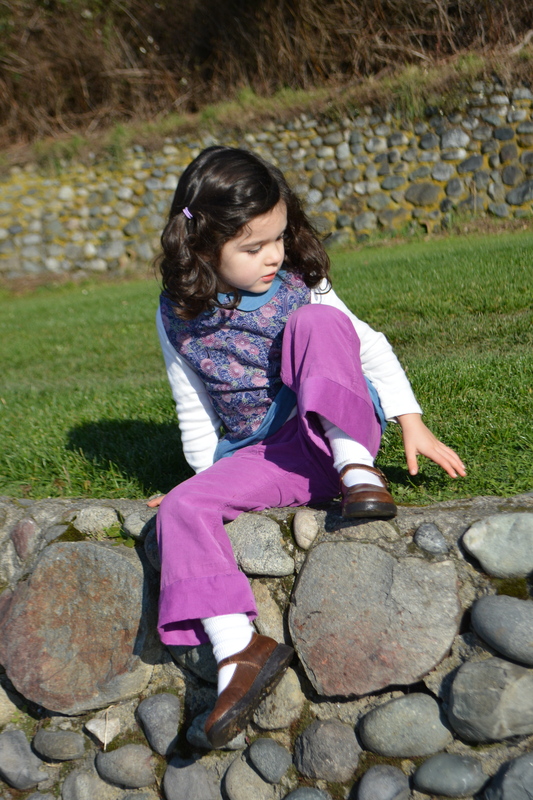 Anyone have favorite pants patterns for 3 year olds? 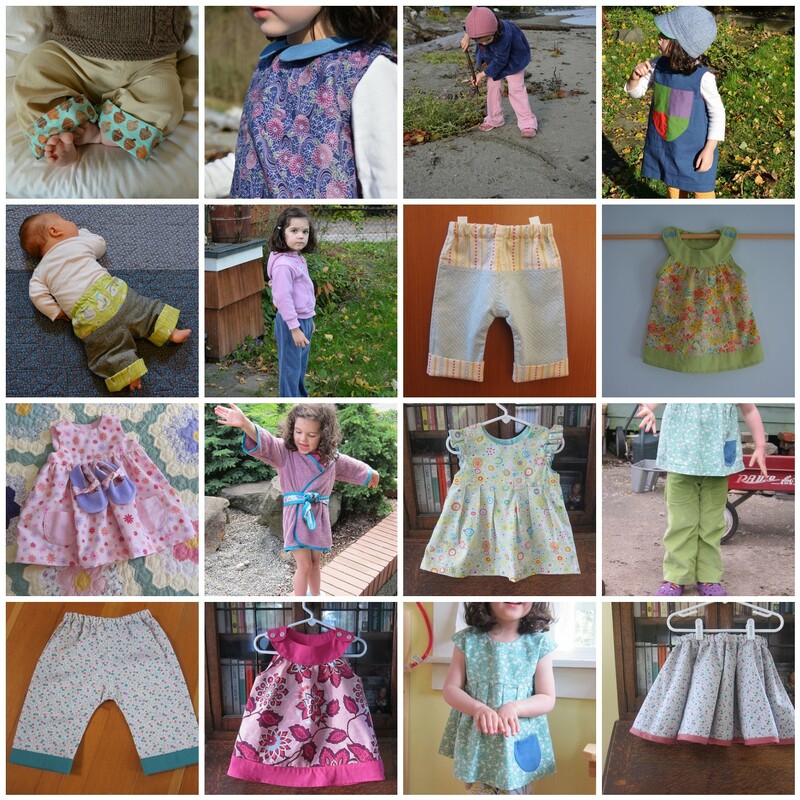 Or favorite fabrics to use? I’d love to hear your ideas! 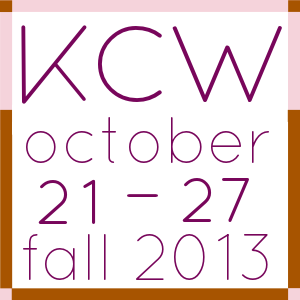 Day 1 of KCW complete! I picked my most basic project for today, which is more of an alteration than an actual project. 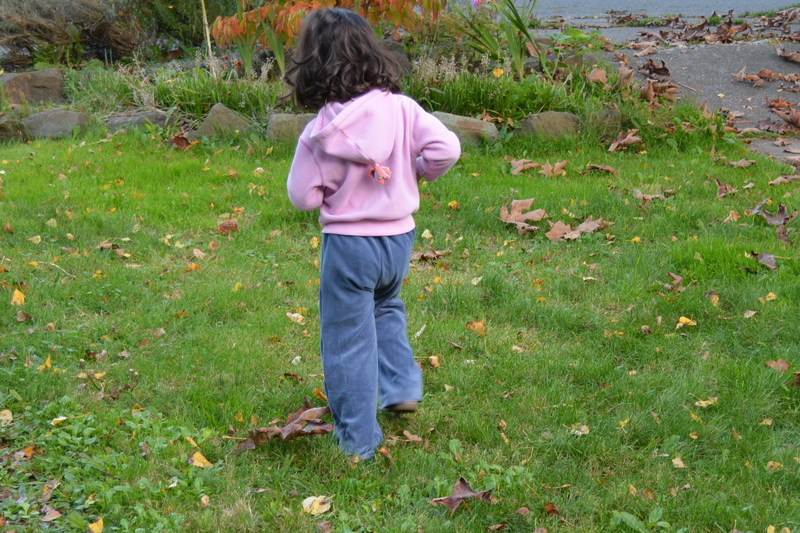 When I inventoried E’s fall wardrobe it appeared that she had tons of pants. Then she started to actually wear them and most were rather short on her. Some serious highwater action going on. 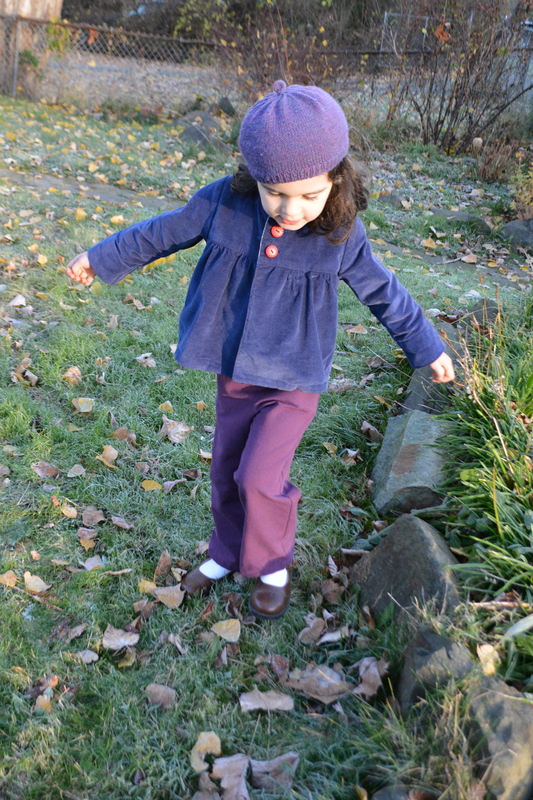 But I hated to pack away the two corduroy pairs I made last spring because they are some of her (and my) favorites. So I thought I’d try to fix them by adding a cuff. I used the construction technique I learned from the Oliver + S sleepover pajama pattern. Really, these patterns are so good. I learn a new technique every time. I didn’t want to add a print cuff because then we have so many more matching issues. So I added two inches of the same corduroy to the bottom instead. The bad- no amount of washing or steam was able to erase the old stitching line or hide the wear on the old hem (as you can see below). 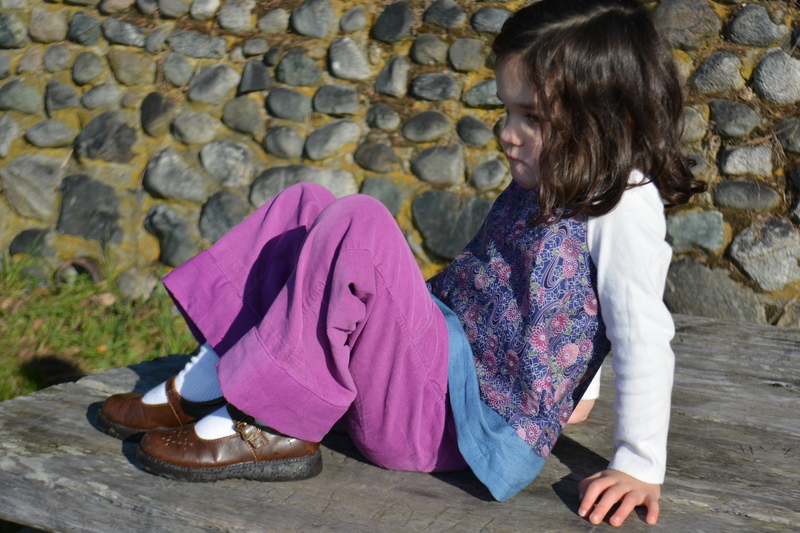 The bottom of these pants are far from elegant, but functional and perfect for preschool. I may go back and add cuffs to the other pair as well, but will cut off the old hem line first. I tried to keep my plans reasonable for this week. I picked easy patterns (I think). I cut everything out in advance. I even made sure I had matching thread this time around. With help from grandparents, E at preschool some mornings, and O’s occasional ability to nap on his own, I’m really hoping to get in one hour a day of sewing. 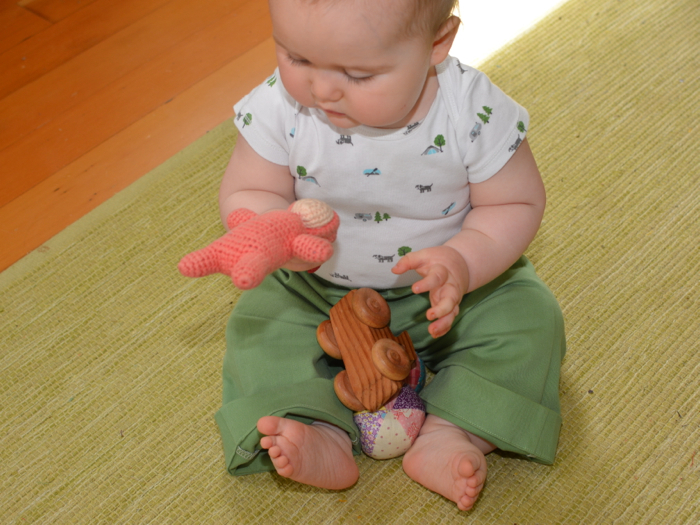 O is growing so fast that it doesn’t make much sense to sew for him right now. 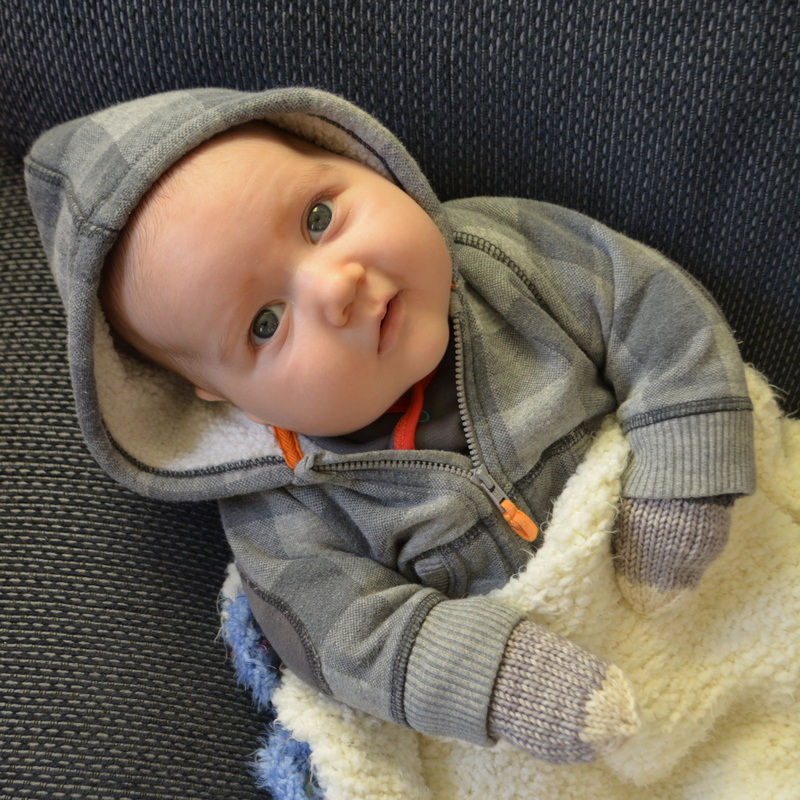 I’ve got a few knitting projects in mind for O as the sizing is a bit more forgiving. Anyone else preparing to join in the fun? I love these weeks!